The folks at the Daily have gotten around to the topic. In haste someone appears to have forgotten the spelling checker. AlexBonzo, who used to work for the Arizona Wildcat, will be teasing me about this. A magazine claimed to have discovered discrepencies [sic] in a scientist's studies. For the second time in the past year, serious questions are surfacing about the work of a prominent University stem cell scientist. According to Peter Aldhous, the magazine's San Francisco bureau chief, while analyzing a 2001 Verfaillie paper printed in the medical journal Blood and a patent application approved in 2006, the publication discovered three images that seemed to have been duplicated between the two. "What appears to be the case is that there were three occasions where there is a gel described, in the paper Blood published in 2001, where the same image is in the patent. But in the patent, it is supposed to be describing a different protein, and in most cases a different experiment," Aldhous said. Timothy Mulcahy, University vice president for research, said the images appear similar, but the University is reserving judgment until an investigation is completed. "Admittedly, if you look at it quickly, they could be the same, and they may be," he said. "And if they are, it begs the question how the same figure got used representing three different things of three different natures." "We are being completely objective in this, so at this time we're not presuming one thing or another," Mulcahy said. "We're simply saying let's look at the facts and let the facts speak for themselves." This latest incident comes on the heels of another University investigation that wrapped up last August, involving problems found in papers published in the journals Nature and Experimental Hematology, which New Scientist also uncovered. In that instance, a panel reviewed the papers and found no evidence of foul play, but did conclude the studies' methods to be "significantly flawed," calling into question the results. Despite so many uncertainties raised in such a short time, the vice president said he doesn't believe it will seriously damage the research reputation of the Stem Cell Institute or the University. "In the long run, how we handle this at the University is actually going to enhance the University's reputation," he said. Anyone who just wandered into this and is unaware of the stem cell controversy at BigU may wish to consult an earlier post concerning Photoshop manipulation of scientific data. The link to "infographic" shows a figure from the New Scientist that illustrates the problem. FOLLOWING concerns raised by New Scientist, the University of Minnesota has launched an inquiry into some prominent stem cell research. Last week, we revealed that three images from a paper on adult stem cells in the journal Blood were apparently used to describe different results in a US patent (New Scientist, 24 March, p 12). One of those images also seemed to be used twice, in mirror-flipped versions, within the Blood paper. The university has informed Catherine Verfaillie, who led the research team, and a former student, Morayma Reyes, that an inquiry is under way. It will determine whether there is evidence to merit an investigation into possible misconduct. The Catholic University of Leuven (KUL) in Belgium, where Verfaillie now works, has also launched an inquiry into the matter. In the next post below, Bonzo takes a potshot at BigU for the latest activities in the athletic department - namely hiring a coach at an astronomical salary when the money could be better used. This topic has been beaten to death lately, and frankly Mr. Bonzo is getting tired of it, or at least feels that protest is futile. [No doubt he will get over it soon.] Below someone has hit a few of the important points. Seems like University of Minnesota President Robert Bruininks only speaks to the public through Sid Hartman (interview, March 25). Can anyone recall a time he addressed the people of Minnesota -- or asked for their input -- about his expensive quest for sports glory? Me neither. As an average-income grad, I might have been inclined to send the U a hundred bucks now and again. But any school that can afford $1.7 million per year for a basketball coach doesn't need my financial help. Put down those pompoms for a minute, Mr. Bruininks, and tell the taxpayers why we need to spend so much money. 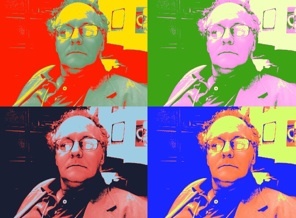 Michael Stokes Paulsen, a prolific and influential constitutional law scholar at the University of Minnesota Law School (who currently holds one of the University's distinguished McKnight professorships), has accepted a senior offer from the University of St. Thomas, also in Minneapolis. That's a big coup for St. Thomas, which under the leadership of Dean Thomas Mengler (formerly Dean of the University of Illinois College of Law) seems to be flourishing. The dean of the University of Minnesota College of Veterinary Medicine is leaving to become the president and CEO of the largest veterinary hospital in New York City. Oh, and by the way, we’ve got a new 1.7 million dollar/year basketball coach. Incentives could up this figure and the contract is for seven years. Google keyword search: “Tubby Smith Minnesota”. The problem is that in each case the duplicated image is used in the patent to describe the production of a different protein from that described in the Blood paper. The local papers have picked up on the recent New Scientist article (see previous post). The accuracy of pioneering adult stem cell research at the University of Minnesota is under scrutiny again, as a scientific journal is questioning whether U researchers used a single image of a protein to represent three different scientific discoveries. The university is investigating, said Tim Mulcahy, the U's vice president for research. The latest concerns focus on a 2001 article in the medical journal Blood and a patent application, approved in 2006, related to the stem cell discoveries. Images in both documents are offered as proof that U researchers used the stem cells, derived from adult bone marrow, to create different types of proteins. But close inspection suggests the images are all of the same protein, not different ones, according to an article New Scientist published Wednesday. While the magazine seems to hint that someone deliberately misrepresented the data, there is no evidence to support that conclusion, Mulcahy said. "The university is going to conduct an objective, comprehensive review but we have no evidence at this point of any wrongdoing. We have to let the process go forward and await a conclusion from the investigation." Fresh accusations have emerged that stem-cell researchers at the University of Minnesota-Twin Cities misrepresented their results in a published report and a patent application. In a paper published in Blood and in a patent based on findings reported elsewhere, the same image appears to have been used to represent the results of two or three separate experiments, New Scientist reported on Wednesday. The work, led by Catherine Verfaillie, who has since moved to the University of Leuven, in Belgium, concerns adult stem cells. Dr. Verfaillie’s surprising results showed that some of the cells, found in bone marrow, could make a wide variety of tissues, like bone, blood, and cartilage. Previously they were thought able to make only a limited set of blood-cell types. The questionable image, a photograph of a gel used to separate out proteins of different sizes, seems to appear twice in the paper. One image shows three blots of protein labeled ß-actin, a protein found in all of the cell types. An apparent mirror image of that gel is shown on the same page, but in the second instance, it is labeled collagen II, a protein found in cartilage. In the patent, the flipped image is said to represent a third protein, one specific to bone, New Scientist reported. The results of a second investigation at BigU should be interesting. Now New Scientist has examined a US patent (number 7015037) granted in 2006 that covers the isolation and use of MAPCs. The patent is exclusively licensed to a company called Athersys of Cleveland, Ohio, which hopes to launch clinical trials of the cells to treat conditions including heart attacks and stroke. Within the patent are three images that appear to be duplicated from another paper from Verfaillie's group, published in 2001 in the journal Blood (vol 98, pp 2615-2625). These images relate to experiments in which MAPCs were grown in culture dishes and made to differentiate into other cell types, such as those found in bone, cartilage, fat and the linings of blood vessels. The images document the presence of proteins specific to each type of cell being produced. 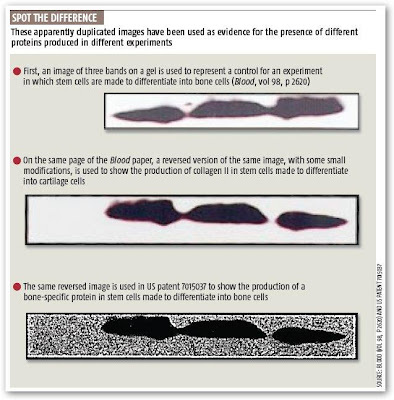 In the most striking example, one of the duplicated images also seems to be used twice within the Blood paper itself, to represent the results from two different experiments. In the Blood paper, this image, which shows a series of three bands on a gel, is first used to represent a control for an experiment in which a culture of stem cells is made to differentiate into cells found in bone. What seems to be the same image is used later on the same page, though this time it is flipped over horizontally, producing a mirror image, and contains some small modifications (see top two images, right). Here, it is labelled as showing the production of collagen in a culture of stem cells made to turn into cells found in cartilage. In the patent, this flipped and modified image appears again, this time supposedly representing a bone-specific protein found in a culture of stem cells made to differentiate into bone cells (see bottom image, right). The research described in the Blood paper formed part of the PhD work of its first author, Morayma Reyes, and the duplicated images in the paper, including the flipped and modified version, also appear in her thesis. Now at the University of Washington in Seattle, Reyes is named on the patent as one of the inventors, along with Verfaillie, who was her supervisor, and Leo Furcht, who heads the department of laboratory medicine and pathology at the University of Minnesota. Currently president of the Federation of American Societies for Experimental Biology, Furcht founded a company called MCL that was assigned the patent jointly with the University of Minnesota. Stem cell biologists contacted by New Scientist are sure that the three images referred to above are duplicates. "They're quite clearly the same," says Jeanne Loring of the Burnham Institute for Medical Research in La Jolla, California. "It appears that a piece of data has been used multiple times to represent different things," agrees Arnold Kriegstein, who heads the programme in developmental and stem cell biology at the University of California, San Francisco. Although the Blood paper is less well known than the publication that followed in Nature, it is significant in terms of the planned clinical trials because it describes cells isolated from the bone marrow of human volunteers rather than experimental mice. Verfaillie, who is now at the Catholic University of Leuven (KUL) in Belgium, and Reyes were unavailable to respond to questions from New Scientist asking for an explanation of the apparent duplications. Athersys said it would review the points we raised, while the University of Minnesota said it had no comment. After being contacted by New Scientist, Blood is now conducting its own inquiry. "We're going to do a serious investigation into this," says the journal's editor-in-chief, Sanford Shattil, a haematologist at the University of California, San Diego. No doubt we will be hearing more about this situation in the future. Are we on the move or badly in need of a reality check? It was a slow week during Spring Break at BigU. Mr. and Mrs. B. were in Bermuda - more about that later - but today’s Daily contains a number of interesting comments related to the Driven to Distraction campaign commented on earlier. Further howlers from OurLeader are also reported. No one should be happy that the University administration is dumping more money into "Driven to Discover." The administration has decided to sink even more money into the [Driven to Discover] campaign. They are now asking for the Regents to allocate $4 million more for the campaign on top of the $2 million already spent. In the report, thoroughly unbiased individuals like the University's marketing director and the College of Biological Sciences Dean were there to tell you how super fantastic the campaign is going. And if you had any qualms about spending more money on "Driven to Discover," there is no need to worry, because a marketer from the Institute of Technology is there to let you know that "it might cost a little bit of money, but what we're going to receive in return will be worth it." Only at the very end of the article was a dissenting voice aired by a mathematics graduate student who suggested a better use of the money would be to take it to Vegas. In other words, this student was suggesting that almost any other use of the money would be better. I agree and have a couple suggestions of my own. In particular, since the administration now says that the ad campaign will cover "education and teaching at the University," and not just research, I have some suggestions on teaching-related functions where the $4 million might be put to better use. I could go on with more space, but the point I'm trying to make with these suggestions is that the University's administration and its marketers need to get beyond the "image" of the University as shown through its ad campaigns and instead focus on the actual reality of what goes on here. In other words, not only do I not see the need for more money to be spent on the "Driven to Discover" campaign, I also don't see why a public university needs a marketing department at all. By now, I think the public knows that teaching and research take place at universities and they don't need ad campaigns to remind them. Instead, what we need are actual policies which show that the administration values teaching as much as it does some types of research. The regents can show their recognition of these realities by rejecting the additional $4 million for "Driven to Discover" and instead putting the money toward actually improving teaching conditions at the University. Bruininks and his wife, Susan Hagstrum, purchased a residence at The Carlyle Condos, located on Third Avenue in downtown Minneapolis. The purchase price was $1,054,716, according to documents filed in Hennepin County last Monday. "The President and First Lady [sic] have opted to keep a home of their own as they are mindful that their time in Eastcliff will someday come to an end - and they would want a place of their own," Wolter said in an e-mail. President Bruininks gave an update on strategic positioning at the meeting. According to University President Bob Bruininks, the University is right on track to becoming a top-three international research institution. "This is all about thinking about the future, when the generation of ideas will be the very currency of our economy," he said. Mr. B. believes that a paradigm shift must have occurred. Bruininks began by restating the goal of reaching top-three status within 10 years, a goal he said is "clearly audacious and aspirational, but it's also something we can achieve." Bruininks played down rankings in favor of achieving a "sustained commitment to cultural improvement" at the University. You simply can’t have it both ways. Now if we are going to achieve “top-three status within 10 years” then clearly that means that some sort of ranking must be done. But then rankings are downplayed. How, indeed, are we to know if we have achieved “world-class greatness” (one of OurLeader’s previous howlers)? Bruininks also discussed research priorities like fuel energy efficiency: a regular schedule for changing light bulbs and more energy-efficient products can save the University $1.5 million each year. "That just gives you an idea about what happens when people just show up every day and start thinking," he said. "You have to give people permission to think creatively to change the place." Whoa! I guess we poor ignorant folk just haven’t been thinking and it has taken the vision of OurLeader to wake us up to start doing this. I am ever so grateful to him for giving us permission to think creatively. "That's our mantra," he said. "To improve the human condition in our society through knowledge." Mr. Bonzo is happy to be back at BigU (especially since creative thinking is now allowed). He looks forward to doing great research with his students, even though the above crapspeak is a little depressing. It will be a quiet week in Lake Wobegon. Bonzos are off on a real vacation - this means no computers. So nothing new will appear for at least a week. Mr. B. has previously reported on the power struggle at the state legislature over the appointment of new members of the Board of Regents (BOR). The committee that vetted the candidates to the BOR sent them up to the full body without any recommendations, even though Governor Pawlenty had picked four. The legislature did not rubber stamp the governor's recommendations. To no one's surprise Dean Johnson, a former Democratic Senate Majority Leader, was one of the new Regents. A pretty good regent - with whom Mr. B. does not agree on most things - Peter Bell, was not renewed. Mr. Bell has Republican ties which were probably the kiss of death. The Legislature on Thursday elected four new regents to lead the University of Minnesota for the next six years. Lawmakers cast aside two incumbent regents — whom Gov. Tim Pawlenty had recommended — and promoted former Democratic Senate Majority Leader Dean Johnson. • Johnson, a Willmar Democrat, who lost his role as majority leader when he was defeated by a Republican in his re-election bid last fall. • Venora Hung, recommended by Pawlenty, a former investment administrator at Cargill and current U law student. • University of Minnesota master's degree student Maureen Cisneros, a former U admissions counselor, as the student at-large regent. • Linda Cohen, also recommended by Pawlenty, a psychologist and Wayzata school board chairwoman. Johnson made a fuss about keeping the tuition increases down at BigU during his campaign for the regent's seat. Although the BOR is supposed to be non-political, the way it usually goes is that when the dems are in control (they are now) the table gets tilted their way, when the repubs are in control they get the advantage. It will be interesting to see how this all plays out. The U has also thrown in the towel on the tuition reciprocity fight and things will stay as they are for another year. Obviously, this was a problem for the administration. First the state of Wisconsin does make up the delta to the state of Minnesota. The problem lies in the U trying to extract the money from the state once it crosses the border. Also, the obvious question is starting to be asked: "Why does the U cost so much more than Madison, when Madison is higher on the academic totem pole?" Mr. B. is going on a Spring break trip courtesy of Mrs. B. who has managed to extract money from the mad publisher for her book. We are going some place moderately warm and sunny (an island) with basically zero student spring breakers. Sun and sand and lots of good books. Can we study the brain from the outside? When will it be possible for humans to fly? University Relations seek funding approval to extend "Driven to Discover" into 2009. More than one year after its launch, the success of the University's "Driven to Discover" marketing campaign drove University Relations to ask for a $4 million, two-year extension. The campaign initially cost $2 million, which covered development and advertising for the first 18 months. That allocation, approved by the Board of Regents last year, will run out this month. If approved, the additional $4 million would support further campaign development and advertising through July 2009. Driven to Discover" officially launched in January 2006 and appeared on campus in September. The campaign sought to help the general public understand the research mission of the University, said University Relations Director Ann Aronson. Aronson said initial reports indicate "good traction in the markets where the campaign media ran," without providing final numbers. But some University students said they don't think the campaign does much for the University's image. "I can think of better ways to spend $4 million, like give it to a Las Vegas casino," mathematics graduate student Nicholas Kirchner said. Again Mr. B. could not help but compare the four million dollars being used for a publicity campaign to the amount of money for community health that BigU could not find. This public health initiative is in BigU’s mandate. An extended and expensive pr campaign is not. Mr. B. has previously commented on the embarrassing situation at BigU where the med school dean has accepted a position on the board of a company whose products are major contributors to the obesity epidemic and the rotting of children's teeth... Mr. B. does not get the Pioneer Press and thanks a colleague for bringing the following to his attention. Three months after Powell signed on with PepsiAmericas, though, the questions haven't ebbed. Outside critics continue to ask why a high-profile state health official would join with a firm whose main products are linked to childhood obesity and diabetes. One U researcher wants a "serious conversation" about the ethics of corporate consulting. Powell said she wanted to be a voice for nutrition in the boardroom. She and her boss — who backs her decision — say the PepsiAmericas position is proper and valuable to the university. That may not put the matter to rest. The appointment has wound itself into the national debate over how food and soft-drink makers do business. The basic questions: Can a doctor take money from a corporation but stay independent? Is joining a corporate board equal to endorsing its products? Food companies have recruited doctors in recent years to serve on nutrition advisory boards and help with "health and wellness" campaigns. University of California San Francisco Medical School dean and former FDA chief Dr. David Kessler, who spoke at the U two weeks ago on the "obesity epidemic," is an adviser to soda and snack food giant PepsiCo. Powell's position is different. As a corporate director, she's responsible for directing PepsiAmerica's management and the company's long-term success for shareholders. The basic dilemma, though, is the same. Can a doctor bridge both worlds? "Ultimately, it involves a personal risk-benefit calculation of sorts: the trade-off between risk of perceived erosion of credibility and objectivity versus prospects of potential benefit for the public good," said Dr. Michael McGinnis, a senior scholar with the national Institute of Medicine and chairman of its children's food-marketing committee, a panel that in 2005 concluded industry marketing and sales practices were putting "children's long-term health at risk." PepsiAmericas chief executive Robert Pohlad serves on the dean's board of visitors for the U medical school and asked her to join his corporate board. [You roll my log and I’ll roll yours ?] The company's top management works out of Minneapolis. Like other outside directors, Powell will be paid in cash and PepsiAmericas stock for her service on the beverage company's board, including a $30,000 annual retainer, $2,000 for each board meeting attended and $60,000 in stock. Some advocates believe health leaders are naive to think they can change the dynamic in the executive suite. "When an expert joins this kind of board, clearly it's going to compromise their ability to speak out," said Michele Simon, author of "Appetite for Profit," a book that accuses giant food companies of preaching public health while pursuing strategies that undermine it. "Denial, it's not just a river in Egypt." It is not too difficult to find further commentary out there on the Electronic Rialto about this sad situation. Many of them are nasty. None seem to support MedSchoolDean's position (and that of Dr. Cerra) other than an endorsement by a soft-drink bottling organization. Two examples follow. Roy Poses, as usual, has a great take on a story that you just could not have made up, even if you tried your hardest. Deborah Powell, the Dean of the University of Minnesota Medical School, has taken a board of directors position for PepsiAmericas, which is interesting considering that Pepsi consumption promotes both tooth rot and obesity. Don't get me wrong, there is such a thing as responsible Pepsi consumption, but should a Med School Dean be in the position of helping to maximize Pepsi sales? Perhaps she can also be on the Board of Philip Morris or Coors? Read the whole story, then roll your eyes and/or bang your head, as you deem appropriate. With all due respect, I do not believe Dean Powell understood the responsibilities of a director of a public, for-profit company. Her job is not to "make her voice heard" about or thus advise the company about public health or health care policy. Her job is to take fiduciary responsibility for the company for the benefit of its stockholders. Her job is to maximize the financial performance of the company, whether or not doing so is in accord with her, or anyone's ideas about ideal health policy. That is why her new position could lead her into conflicts of interest. I wonder whether leaders of academic health care who have more acute conflicts of interest, because they also are directors of pharmaceutical, biotechnology, medical device, managed care, or contract research companies, may similarly misunderstood, or rationalized their corporate responsibilities. If so, they ought to be better informed. But as long as they accept fiduciary responsibility for for-profit health care companies, they are liable to acute conflicts of interest between those responsibilities and their responsibilities to uphold the academic health care mission, which requires putting the care of individual patients first, and creating and disseminating knowledge through free enquiry. Normally citizens of ColdState don't like to complain about the weather. Stiff upper lip and all that. But BigU was actually closed at 2:30 pm yesterday because of the latest snowstorm. This is the first time that BigU has been closed for weather related reasons since 1990 or something like that. So I guess it is a big deal. Officially the U is open today, but I am a little dubious about how many people will be over there. My alley has not been plowed yet and it is pretty tough to get out when there is a foot plus of snow. So, shortly I'll fire up BlueBabe for only the third time this season (not complaining) and get things dug out sufficiently to go to work.